TWO Donegal choirs feature on a major new RTE album 'One Hundred Years a Nation' - a specially-commissioned piece of choral music from composer Shaun Davey and writer Paul Muldoon. The CD which was recorded with the RTÉ National Symphony Orchestra along with conductor David Brophy, features the Donegal Abbey Singers and the Donegal Youth Choir. Issued on the RTÉ lyric fm label, the CD is included free in this week’s edition of the RTÉ Guide. 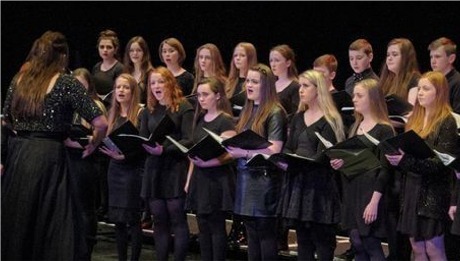 The Donegal singers were among 31 choirs from 19 different counties who took part in ‘A Nation’s Voice’ on Easter Sunday, March 27, 2016 at the National Museum, Collins Barracks. The global singers ranged in age from eight to 85 years. The recording was one of the largest scale recordings ever undertaken by RTÉ. It involved more than 200 microphones and hundreds of meters of cabling. The event was hosted by Miriam O’Callaghan as part of the official State programme of events for the centenary Easter Sunday. Meanwhile, RTÉ One television will broadcast 'One Hundred Years a Nation', featuring the local singers on Wednesday, December 21, 2016 at 11.20pm.